World No. 2 Rafael Nadal cruised in his Miami opener Friday night, dismissing Santiago Giraldo 6-2, 6-0 in the second round of the Sony Ericsson Open. 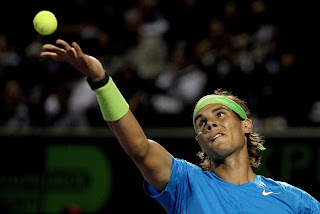 Nadal capitalized on five of his six break point opportunities, reeling off the final 10 games to claim victory over the Colombian for the fifth straight time in 69 minutes. "He hit the ball very hard at the beginning of the match. I thought it's going to be a very difficult match," said Nadal. "[It was] 2-2, 0/30. I came back in that game with a few good serves.I think after that I didn't have mistakes... When I had the chance to hit the ball with my forehand, I did. I think I [played] a very good match." "The Latin crowd makes this tournament very, very special," Nadal said. "I would love to win one time in my career, but [I've done] well. I played three finals." In the third round, Nadal will face 25th seed Radek Stepanek.Stepanek is looking to defeat Nadal for the first time in their sixth meeting.